We are expanding this section shortly to include additional personal details about Stanley, outside of woodworking! I thank you for reading about my handcrafted furniture. Please be assured that there are no finer hand-made reproductions being created today. I served a seven-year apprenticeship with C. N. Grinnell of the well-known Grinnell family of woodworkers, who have passed down the trade from 1614. The Grinnells were among the first settlers of Providence, Rhode Island. The later established themselves in Medina, New York, a furniture center of the eighteenth and nineteenth centuries. Western settlers of the Grinnell family founded Grinnell, Iowa. 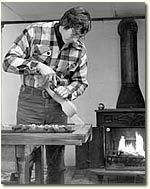 Clarence Grinnell, called Larry, was my teacher and the last of the Grinnell craftsman. His last wish was to see the trade of woodcarving, furniture making, and antique restoration, finishing, and design passed on before he left this world. His wish was met in that I was his last apprentice. Larry was a hard taskmaster. His rule was that if it was good enough for his father, his father's father, and so on, it was good enough for me to make it that way. And make it that way I did. It took seven years of hearing "Boy, when you can carve a strait line strait and a curved line curved, you will be a woodcarver." Today I can carve a straight line strait and a curved line curved, so I guess I'm a woodcarver. Larry also used to say that a woodworker should make things as good where they can't see it as you do where they can. Well, Larry is gone now, he died at age eighty-seven, but he practiced his craft up till the last. I miss the old craftsman, and in his name I carry on the heritage of the tradition of fine craftsmanship. 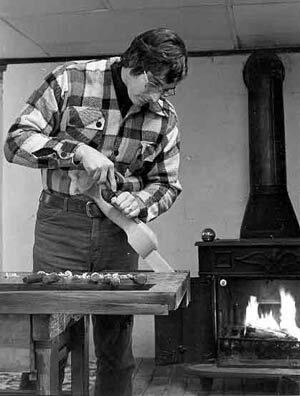 I have dedicated my catalog, and now this website to my friend and teacher, Clarence N. Grinnell, master woodcarver, furniture maker, and designer, and it is now my hope to pass on this heritage to my son Eric who is now working with me to fill commissioned works. The "Concise History of Period Furniture," offered on this site, is a gift from Larry, as he always said "Give something extra and they will always come back." He also said that knowledge is something you can give away and always have. In that spirit I wrote what I hope will be a useful guide for lovers of fine furniture, something that will make this website more than a catalogue, but a site for reference and historical value. On the pages of this site, you will see samples of my art with a history of each period piece for reference. If you are interested in purchasing the pieces shown, or have designs of your own that you would like produced, please contact our home studio. All commissions done from pictures or drawings are subject to the craftsman's personal interpretation of the piece.